I like plucking little known but fascinating people from the pages of newspapers published 100 years ago, and damned if Dr. Edward W. Ryan, of Scranton, PA, isn’t one of the most interesting I’ve read about. Dr. Ryan was a fearless and manic physician and he was everywhere in the 1910s. He may have first arrived in the public consciousness on today’s date, May 1, 1914. 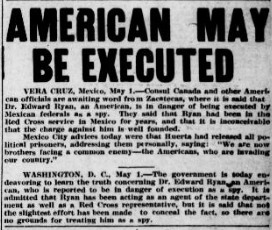 That’s when several American papers published notice that he was about to executed in Mexico, as a spy. The Mexican Revolution was in full swing in May, 1914, and it seemed like America might join in the fray at any moment to make it a full shooting war between our nations as well, because why not? After all, President William Howard Taft’s secretary of state, Henry Lane Wilson, had colluded with the Mexicans to bring about a coup in 1913, overthrowing Mexican president Francisco Madero and installing Victoriano Huerta in his place. Of course America screwed it up, because Huerta ended up being a brutal dictator. By this time in 1914 troops loyal to him had come face-to-face with American warships at Veracruz and there were prisoners being taken and people getting killed on both sides. U.S. newspapers were in a froth about the whole thing, each day. Events in Mexico were a complete obsession–at least for the media. Like the Spanish Inquisition, no one expected the Great War to come, elsewhere. Ryan’s quiet life as a New York City doctor came to an abrupt end in 1913. When the U.S. Department of State went looking for volunteers to help evacuate American citizens caught up in the ongoing Mexican revolution, Dr. Ryan answered the call to adventure. After working in various parts of Mexico, Dr. Ryan ended up in the city of Torreón in the state of Coahuila.Everything went well until the day when Dr. Ryan was captured by a rebel leader from the neighboring state of Zacatecas and declared a spy and prisoner of war. And so began Dr. Ryan’s first near death adventure. As The [Scranton, PA] Republican described it in his obituary, “the conventional order to ‘be shot at sunrise’ became a serious reality for Dr. Ryan, and the next morning, he was lead out to the post where he was to meet his death. His sentence of death was read to him, but he listened to it with such calm contempt and stoic demeanor that his enemies – especially the rebel chief – abandoned their plans for his immediate death. Better to say that they postponed their plans, for the performance was repeated the next day – and for thirteen consecutive days. Then, through some whim of their captors, Dr. Ryan and a few associates who had been taken prisoner with him were set scot-free and went soon on their way back to Mexico City. The local physician later denied the statements of his associates that he had been ‘stoical’ under the harrowing experience in the rebel camp, rather explaining that after the first few sunrises he began to get rather hopeful, and finally got used to it. The State Department of this country interested itself in having Dr. Ryan released and overnight he became a national figure.” While Dr. Ryan seldom talked about any of his own adventures, others – awed by his complete lack of fear – did that for him. And so the Ryan legend was born. The dude was the real deal. No one wants to die, but a lot of people probably like to think that if it death becomes inevitable, they’ll greet it with that kind of stoic calm–on the surface, anyway. Dr. Ryan, who specialized in treating “fevers”–illnesses like typhus, for example–was himself killed by malaria while in Tehran on September 18, 1923. 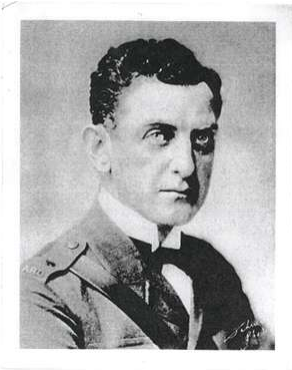 He was just 39, and due to work he did throughout the Great War as lieutenant colonel in the U.S. Army, responsible for the American Red Cross commission to Western Russia and the Baltic, he was a decorated hero. As the Scranton Times-Tribune reported in December, 2012, Serbia eventually awarded Dr. Ryan “commander of the White Eagle and commander of the Order of St. Sava” in addition to “the Charity Cross and the Red Cross.” His service in Estonia after the war led to that nation awarding Dr. Ryan “Officer First Class of the Order of Liberty.” According to the Scranton paper, he received similar awards from France, Russia and Greece, to name a few. It’s great that his hometown papers remember him, as does the State Department, but Dr. Edward Ryan sounds like the kind of guy who deserves a little more. He packed a lot into 39 years, made all of it count. He was gone when my grandpa was still in short pants, but he has all my respect. Thanks for bringing the story of this great American physician to a contemporary audience. I am also writing about Edward Ryan in relation to a book about typhus. To further show what a badass Ryan was, here is the story of the typhus epidemic in Estonia that Ryan helped bring under control. When the White Russian forces under Nikolai Yudenich failed in their bid to capture Petrograd from the Bolsheviks in October of 1919, their shattered remnants limped into Estonia. Fourteen thousand White Russian soldiers were stricken with typhus and poured into the camp hospitals, precipitating a typhus outbreak involving a 20,000 persons. In the worst hospital at Reval, run by the Russian Red Cross, consisting of a single barrack with 460 beds in one room, there were 600 deaths in one week. The conditions at the Reval Hospital were so bad, that the Estonian government disbanded the Russian Red Cross units in Estonia. British, French, Russian, and American doctors tended to the sick, but their number was too few; 400 doctors and nurses were needed, but only thirty were available, and their ranks were soon thinned by typhus. Conditions in the city of Narva were particularly bleak. The hospitals were without doctors and nurses and the remaining orderlies had given up. Walter Duranty of The New York Times reported: “Living and dead are huddled pell mell on the bare floor, without even straw to lie upon, in all the horror and filth of typhus, dysentery, smallpox, wounds, frostbite, pneumonia, and gangrene. The sufferers are fortunate if they get a cup of milk or a bowl of soup each daily. Men have been there for weeks without even having had their clothes removed. They are too weak to move or make any effort to clean themselves.” The mortality rate of the typhus cases was up to 40%. Due to the dire situation, in February 1920, the Estonian Government declared a state of emergency and granted an American Red Cross Commission, under the direction of U.S. Army Lieutenant Colonel Edward Ryan MD (who had also directed the American Red Cross (ARC) in Serbia during the 1915 epidemic of typhus) all necessary authority to combat the typhus epidemic. In Estonia, martial law was declared and the Russian leaders turned over authority to Estonian General Johan Laidner. Laidner demanded absolute cooperation, under penalty of court martial and execution, from his troops to implement hygienic measures in the entire country. Initially, the Russian troops were reluctant to accede to the authority of an Estonian general, but soon cooperated. Additional trained personnel were also recruited; ninety ARC nurses arrived on March 1, 1920. Then the ARC instituted strict quarantine rules and no travel was allowed without a permit. An ARC report described the measures implemented in Estonia to deal with the pestilence: “with the aid of the Estonian Sanitary Corps, began the organization of clean-up squads among the Russian soldiers. It was necessary at the beginning for the American to give actual demonstrations in the cleansing of patients who had been helpless and unattended for weeks. They cut the hair and beards of the men, bathed them, put them in clean clothes and carried them back to the beds which in the meantime had been fumigated and provided with clean linens. Following the American example and under American command, the Russians worked in squads of fifty men each with soap, water, and disinfectants, cleaned patients, beds, linen and the buildings of the temporary hospitals.” These squads acted as a sanitary strike force to completely sanitize a 400-bed hospital within a single day: ten men or so would bath the patients, cut their hair, and treat them with kerosene. A second group disposed of infested clothing and bedding. Straw from the bedding was burned. A third group cleaned the beds with carbolic acid; another group scrubbed the floors; a fifth group treated the walls, ceiling, and windows. Finally, the last group would bring in the clean linens and blankets and stuff the mattresses with clean straw. The hygienic measures had resulted in a rapid improvement in mortality rate in the hospitals; in one hospital, the mortality rate dropped from 8% to 0.5% after the sanitary make-over. Every railway car in the nation was disinfected after each journey. Delousing stations were set up on each railroad platform. Travel restrictions were put into effect and all travelers needed delousing certificates to be allowed to travel. Cinemas and theaters were closed during the emergency. These sanitary squads, which were composed of soldiers who had survived typhus and thus were immune, deloused 9,000 people in Narva alone, disinfected 80 hospitals, and manned the cordon sanitaire shielding the rest of Estonia from typhus. Using this technique and supplies provided by the ARC, the Estonian Government fielded 80 sanitary squads (4,000 men) to squelch the threat of typhus to Estonia. The Estonian Sanitary Corps, supplemented by the Estonian Red Cross, mobilized thousands of volunteers who worked tirelessly in combating the spread of the plague-spreading insects in schools, churches, and private homes. Also, a number of sanitary stations were set up on the Russian border to inspect and delouse the refugees coming in from Russia. By mid-March of 1920, the Estonian typhus epidemic was subsiding. Just as the mission was nearing its completion, Capt. Henderson and three of his fellow ARC officers (Capt. Wilbur Howell, Lt. Clifford Blanton, and Lt. George Winfield) were stricken with typhus. Although Henderson and Howell recovered, Blanton and Winfield died on March 26 and 28, respectively. At this time of the Ebola epidemic, we could use more bad-asses like Dr. Edward Ryan to help bring it under control.